A 66-year-old African-American male presented with a four-month history of asymptomatic hematuria. Interventional Radiology was consulted for embolization of bilateral native arteries in this patient on hemodialysis. His past medical history was significant for end-stage renal disease secondary to polycystic kidney disease. Patient underwent right kidney transplantation 21 years ago, which ultimately failed 15 years ago. CT scan of the pelvis showed multiple avidly enhancing lesions of various sizes throughout bilateral native kidneys (Figure 1). Subsequently, angiography was done in order to evaluate for embolization. 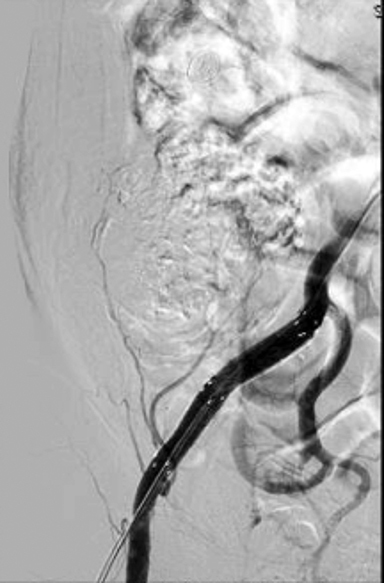 A digitally subtracted oblique image of the right external iliac artery demonstrated a pseudoaneurysm (Figure 2). Finally, a digitally subtracted image after covered stent placement showed no pseudoaneurysm filling (Figure 3). 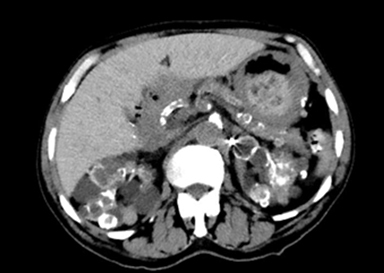 Multiple bilateral hypervascular masses were suspected to be the source of the hematuria. Angiogram also showed an incidental finding of a pseudoaneurysm in the right external iliac artery. There have also been a few rare incidences where pseudoaneurysms have been discovered in patients with failed renal transplants. One particular study looked at 843 renal transplants performed over a 37-year period. Only three, or 0.35 percent, of those patients developed a pseudoaneurysm at the anastomotic site.2This is the case in the patient presented in this report. The incidental pseudoaneurysm discovered in this patient was at the site of anastomoses of the right external iliac artery to the graft renal artery. The patient in this case had a unique presentation. Angiography used to aid in the discovery of the site of the bilateral hypervascular renal masses thought to be the source of hematuria led to the incidental finding of a 3.9 cm by 2.3 cm pseudoaneurysm at the site of anastomosis between the right external iliac artery and graft renal artery. Our patient did not have any signs or symptoms that were directly caused by the pseudoaneurysm. The patient did not have pain in the area, swelling, pulsatile mass, or bruits. Also, our patient’s case was unusual compared to the two cases previously mentioned in that our patient was presenting 21 years after transplantation and 15 years after rejection. Most published research describes pseudoaneurysm and its complications being discovered within several weeks after transplantation or failure. There is no definitive way of confirming how long the pseudoaneurysm had been present in this patient. However, based on the literature where pseudoaneurysms were discovered along with the failure of the renal graft, it is to be assumed that the pseudoaneurysm was present in our patient for 15 years. Because of this, a prompt therapeutic approach was undertaken. 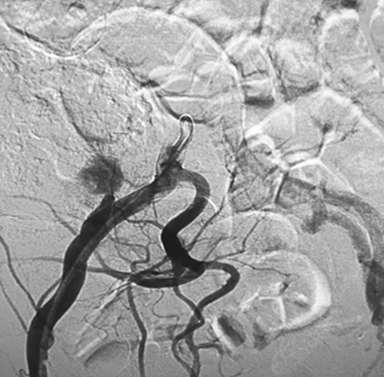 There is much debate on how or whether to treat asymptomatic pseudoaneurysms. Due to the uncertainty of our patient’s pseudoaneurysm, it was determined that a placement of a covered stent in the right external iliac artery would be the best option. In the procedure, a 10 mm by 40 mm covered stent was extended beginning just distal to the take-off of the right internal iliac artery. An arteriogram after the deployment of the 10mm x 40mm covered stent showed persistent blood flow within the pseudoaneurysm with take-off near the distal aspect of the stent. An additional 10mm x 80 mm covered stent was then deployed beginning distal to the take-off from the right internal iliac artery, landing proximal to the takeoff of the right inferior epigastric artery. Post stent deployment angiogram of the right external iliac artery demonstrated no flow into the pseudoaneurysm. Our patient had an unusual presentation of a pseudoaneurysm. Pseudoaneurysms associated with failed renal transplants are typically detected within weeks after transplantation and along with failure of the transplant. Our patient’s pseudoaneurysm was detected 21 years after transplantation and 15 years after transplant failure. Rupture of a pseudoaneurysm can occur at any time, and treating it with a covered stent is a feasible option. Saad NE, Saad WE, Davies MG, Waldman DL, Fultz PJ, Rubens DJ. Pseudoaneurysms and the role of minimally invasive techniques in their management. Radiographics. 2005;25 Suppl 1:S1. Orlić P, Vukas D, Curuvija D, et al. Pseudoaneurysm after renal transplantation. Acta Med Croatica. 2008;62 Suppl 1:86-9.73-89. Webber GW, Jang J, Gustavson S, Olin JW. Contemporary management of postcatheterization pseudoaneurysms. Circulation. 2007;115(20):2666-74. Kubal C, Cacciola R, Riley P, Ready A. Internal iliac artery pseudoaneurysm following renal transplant biopsy successfully treated with endovascular stenting and thrombosis: a case report. Transplant Proc. 2007;39(5):1676-1678. Patel N, VeeanS, Rotem E, Vo H. External iliac artery pseudoaneurysm in patient with history of failed kidney transplant. Appl Radiol. 2017;46(6):30-31. Prepared by Mr. Patel and Mr. Veean while third-year medical students; Dr. Rotem while serving as Chief of Vascular & Interventional Radiology and Program Director of the VIR Fellowship; and Dr. Vo while an Assistant Professor of Interventional Radiology at the Medical College of Georgia, Augusta, GA.